It's fun to change your hairstyle, wearing it straight one day and curly the next. But if it's a curly hair day and you just ran out of hairspray, you may need some modifications to your hair styling routine to keep your hair curly throughout the day. Skip the shampoo. The natural oil in your hair can help hold the curl without the spray. Condition damaged ends. Split and damaged hair can make it harder for you to curl your hair. Dabbing on a small amount of light leave-in conditioner can help. Add volumizer to your hair. Volumizer works especially well if you have fine, limp hair. It adds volume to your roots, helping your hair hold its style. Blow dry your hair upside-down. If you don't have volumizer, blowing your hair dry while holding your head upside-down can help add volume and lift to your roots. It also adds movement and bend to your hair to help ease styling. Use professional grade tools. Professional curlers and rollers heat to a higher temperature and the heat is more evenly distributed throughout the tool. You can find professional tools at a beauty supply store. When you wash and condition your hair, use a light conditioner to prevent conditioner buildup, which adds weight to your hair. 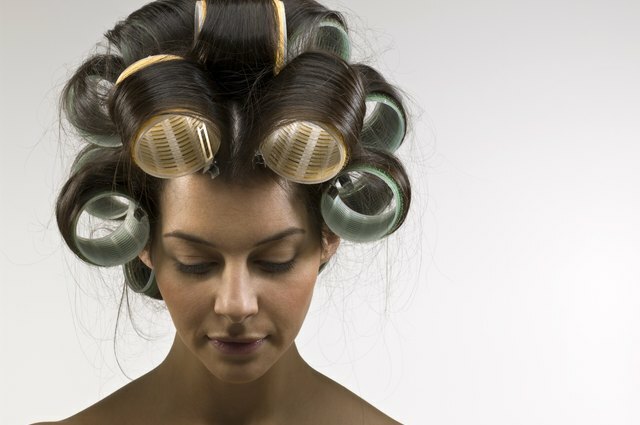 Be careful when using hot curling iron or rollers to prevent skin burns. Unplug your hair curling iron and rollers immediately after use.